NOTE: ALL SNOWSHOES HAVE BEEN SOLD! THANKS! Okay all you local readers. Here's a chance to own a piece of history and support kids being healthy and active at the same time. I work at the Lee & Rose Warner Nature Center and we've been teaching kids to snowshoe for over 40 years. Over those years our audiences have grown a little younger and we're looking to buy some new mid-sized snowshoes. 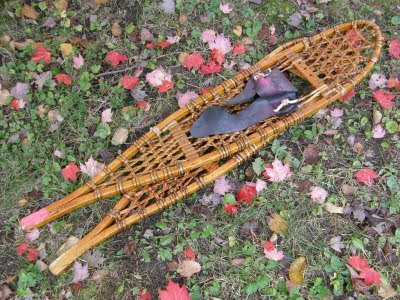 To raise money we are selling off some of our alult size vintage ash wood snowshoes. The money raised will go directly toward new kid-sized snowshoes. There are two types to choose from. First up are the Michigan Style snowshoes (pictured above). These were the work-horses of our program for 40 years. They have been well maintained but are a little heavier than when they started because of layers of varnish. They are fully functional or can be used as decorations for your home or cabin. These come with universal quick bindings attached. We're asking for a donation of $125 per pair. These sell new for around $200. Many of these are engraved SMNC on the tail for Science Museum Nature Center (our old name back in the 1960s.) They are a really cool piece of history. Speaking of a cool piece of history . 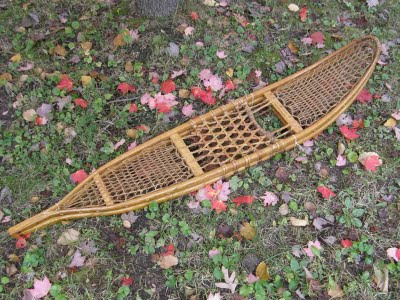 . . we're also selling off a limited number of vintage World War II army snowshoes (see photo below). These have never touched snow and are in excellent condition. They are larger Alaskan style snowshoes. They are rawhide laced and made of wood. They are beautiful to decorate a cabin but would be even more awesome silently crunching though deep snow with history strapped to your feet. The Alaskan snowshoes are $175. They do not come with bindings. Of course, if you just want to make a donation so kids can experience snowshoeing and you don't want a pair of snowshoes in return that's okay too! IN CASE YOU MISSED IT AT THE TOP--ALL SNOWSHOES HAVE BEEN SOLD! Thanks everyone!